This dissertation investigates the prosodic and intonational characteristics of Western Cham (three letter code for International Organization for Standardization’s ISO 639-3 code: [iso=cja]), an Austronesian language in the Chamic sub-group. I examine acoustic variables of prominence at word and postlexical levels: syllable duration, pitch excursion, and mean intensity. WC syllable duration is highly correlated with word level prominence. Western Cham disyllabic words display a strong iambicity, with final syllables having twice the duration of initial syllables. This iambicity is also present in phrases comprised of two monosyllabic words. Phrase position has an effect on syllable duration and pitch excursion. Syllables in phrase-final position showed a lengthening effect and display greater pitch movement in phrase-final position. I also present a tonal grammar of Western Cham using the Autosegmental-Metrical framework and the Tones and Break Indices (ToBI) labeling convention. Two prosodic units above the word level were defined: the Accentual Phrase (AP) and Intonational Phrase (IP). Three kinds of tones are defined: edge tones, phrase tone, and pitch accent. With this inventory of tones, a mapping of sentence types to tonal contours is presented. Bin Abdul Hamid, Mohamed Effendy. University of Hawai’i at Manoa. 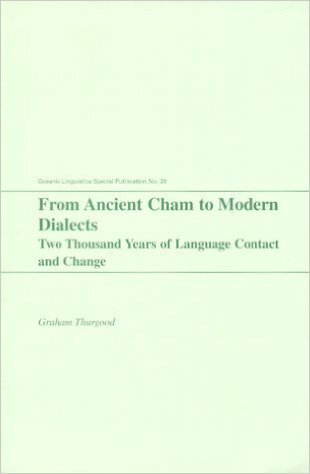 The dissertation argues that the Cham religious elite secured the social and cultural continuity of Cham society to the present day. They, and Cham society, survived the end of the Cham kingdom of Panduranga because the Nguyen emperor Minh Mang (reigned 1820 to 1841) did not remove them. The Vietnamese rulers who succeeded Minh Mang after his death in 1841 were not interested in assimilating the Cham because they faced many internal and external problems. The French colonial period brought great changes to Vietnam but the Cham, though protected by the French, were ultimately ignored in the colonial economy. The French instead devoted attention to Cham historical, anthropological and archeological research in the late 19th and 20th centuries. The Cham were able to continue their traditional way of life with the Cham religious elite taking center stage in Cham society. They built up their hierarchies with the teaching of anak saih or “students” to carry on the legacy and practice of important Cham ceremonies and rituals to the present day. Nager Cam (Champa) lived on through the activities and efforts of the Cham religious elite. The exhibition of the Cham culture in Hawaii in 2010.